The Colombo Plan Staff College for Technician Education (CPSC) is an autonomous specialized agency of the Colombo Plan. It was established on December 5, 1973 at the 23rd Consultative Committee Meeting of the Colombo Plan held in Wellington, New Zealand to assist the member countries of the Colombo Plan in developing and enhancing their technician education systems. It became operational in 1974 with the Republic of Singapore serving as the first host Government. In January 1987, CPSC moved to Manila, Philippines upon the invitation of the Philippine Government. CPSC was founded by 26 countries which include Afghanistan, Australia, Bangladesh, Bhutan, Canada, Fiji Islands, India, Indonesia, Iran, Japan, Khmer Republic, Republic of Korea, Laos, Malaysia, Republic of Maldives, Myanmar (Burma), Nepal, New Zealand, Pakistan, Philippines, Singapore, Sri Lanka, Thailand, United Kingdom, United States of America and the Republic of Vietnam. They collectively agreed that a regional center for technician education and training needed to be established to assist countries in Colombo Plan region in this area. The said countries cooperated under south-south cooperation which has been the principal framework for CPSC’s programs and activities from its inception until now. CPSC has 26 member countries classified as charter and current members. There are sixteen (16) active member countries, eight (8) charter member countries and two (2) honorary member institutions of CPSC as of FY 2016-2017. 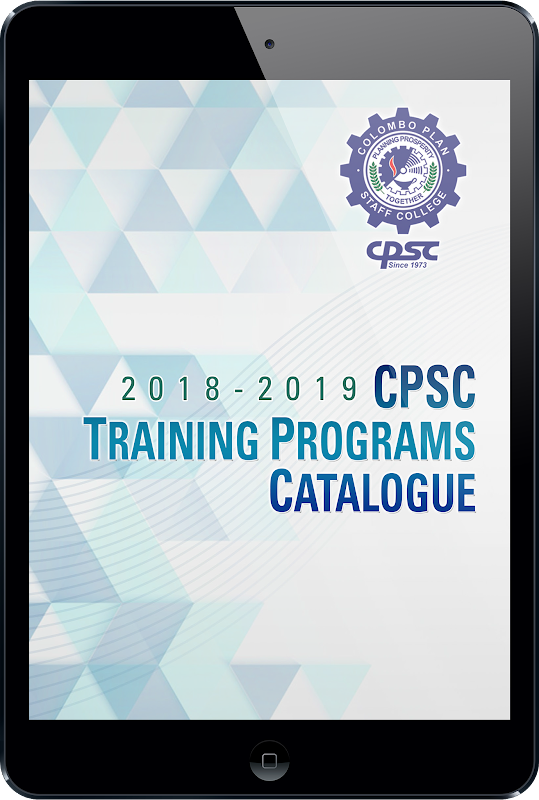 CPSC is a unique Inter-Governmental Organization (IGO), which consistently addresses issues in Technical and Vocational Education & Training in the Asia and the Pacific region. For over four decades, CPSC continues to assert its role in advancing human resources development across the region. The purpose of the Staff College is to improve the quality of technical education and training in the Colombo Plan region. This is done by meeting the needs for technician education of teacher educators and trainers and senior staff in the field, who can play a more active part in in-service training and staff development. Collect and disseminate information on technician education and training. CPSC's QMS under ISO 9001:2008 underwent re-assessment audit this year on the following areas: Management Responsibility, Internal Quality Audit, Customer Satisfaction Measurements, Corporate Planning and Policy Formulation, Membership Management, Projects, Human Resources, IT Media Services/Information Dissemination and Publications Development, Housekeeping/Maintenance, Customer Feedback Handling/Satisfaction Measurement/Document and Records Control, and Procurement. "The QMS has been utilized by CPSC as one key mechanism for the implementation of its 5-year strategic plan from 2013 to 2018. It continues to be consistent with the Quality Policy. ", states the audit report of the Certification International, Philippines (CI) per findings on CPSC’s Quality Management Systems (QMS) during the Re-Assessment Audit held on May 6, 2016. CPSC's QMS is recommended for continued certification under ISO 9001:2008 based on the said results. With this accomplishment, CPSC remains steadfast in maintaining the international quality mark as an instrument to enhance competitiveness in its services and in meeting member countries’ needs and expectations. Since its certification in 2001, CPSC has delivered quality services with continuous acknowledgement through certification and CPSC has been recertified for another year onward.